Again, I’m going to ask you if you’ve watched “Food, Inc.” yet. If you haven’t, I can’t stress enough how important watching this film is. It is just the first, yet completely crucial step that anyone in America who cares about themselves at all needs to take to understand what is going on in the United States food industry, and how it affects all of us. If you haven’t watched it yet, seriously – you need to watch it. If you need to borrow my copy, let me know. Not “edible foodlike substances” – highly processed concoctions designed by food scientists, consisting mostly of ingredients derived from corn and soy that no normal person keeps in the pantry. 2. Don’t eat anything your great-grandmother wouldn’t recognize as food. A highly sweetened, artificially-colored, yogurt-type substance in a plastic tube is not food. 8. Avoid food products that make health claims. For a product to carry a health claim on its package, it must first have a package … that’s not real food. 9. Avoid food products with the wordoid “lite” or the terms “low-fat” or “nonfat” in their names. 18. Don’t ingest foods made in places where everyone is required to wear a surgical cap. 20. It’s not food if it arrived through the window of your car. 21. It’s not food if it’s called by the same name in every language (think Big Mac, Cheetos, or Pringles). There are a lot more great insights in this book, and I definitely recommend it. 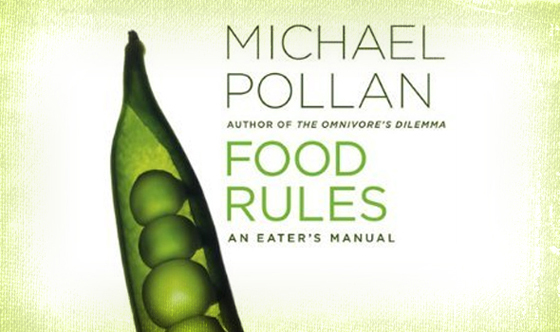 With “nutrition” and the American food industry becoming as complicated as it has been, the basic principles of this book are definitely a solid starting point. While I personally don’t agree with Pollan’s statement, “Vegetarians are more healthy than carnivores,” which actually is comparing humans to animals, as “vegetarian” animals are actually “herbivores” and humans are omnivores, not “carnivores” … I very highly regard most of his ideas as sound: we should be eating what is produced naturally – plants and animals, and that very processed and especially food-like items that were really generated by human technology and chemistry, while originally touted as triumphs of science, should really be avoided. Saccharin, high-fructose corn syrup, and margarine are a few fantastic examples.